God does not force our feet to go out among the messy world. God does not bend our wills until they match his. God does not pry our fingers loose from our pocketbooks. God does not manipulate our mouths until they share His truth with others. And you know what? My feet will not move, my will won’t match His, my hands will not give, and my mouth will not share until I choose to live my life with intentional purpose. In the next few weeks, I am going to write a few entries on intentional living. 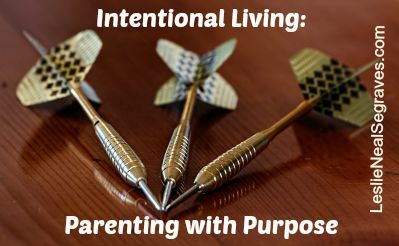 I will start off with a post about intentional parenting. One child of mine is seven years old. Did you know I have approximately seven more years to steward and disciple her worldview? Research indicates that worldview develops most between 4-14 years of age. Most deep-seated convictions take root by this young age of 14. I want my kids to live outward focused lives, to understand the power of prayer, to willingly stand on truth even if they stand alone, to love Jesus and worship him deeply, and to live courageously for the purposes of God among the lost and hurting. If I allow my kids’ lives to revolve only around their education, their sports, their extra-curricular activities, their friends, their entertainment, and their needs; they could assume that life exists for them, around them, and because of them. We obviously want our kids to enjoy life. We have fun as a family. We want them to have opportunities to succeed. We seek to provide places for personal development. But my primary task is to raise them for eternity – not for fun adventures, not for college, not for earthly success, not for a future spouse. I want my kids to live out 2 Corinthians 5:15, “And he died for all, that those who live should no longer live for themselves but for him who died for them and was raised again.” But I realize I must exemplify this lifestyle among them AND not allow them to live their lives as if life is all about them. Church attendance a couple of times a week probably won’t be all it takes to disciple them to live out 2 Corinthians 5:15. So for example, if I want my kids to have hearts and hands that serve, then I must discover intentional ways for them to regularly serve and help others now. I am excited about an upcoming event with our organization (www.10/40 Connections.org) that allows my kids to actively engage. We are asking individuals to fill themed baskets or donate funds for our staff to fill baskets for a silent auction. This event gives me a chance to actively disciple my kids in using their hearts and hands to serve someone else. I found a basket that connected to my kids’ hearts – that they would enjoy filling. I will sit with my kids and explain the themed basket silent auction. I will tell them which basket we are doing (we are filling two – one for each organizational dinner). We will pray for creativity. We will have a family work day where they will join us in extra chores so they can earn some of the money to purchase gifts for the basket (they then will take ownership of the project). We will plan ahead and talk about what we should place inside. We will go to a store and buy items to fill our “basket” (we are actually filling little red wagons!). We will talk about investment and how our $100 will generate more than $100 because of the silent auction idea. We will ask God to raise up many families who really want the baskets so that the bids go higher and then help more people overseas! We will talk about how the money will be spent overseas and what it must be like to live among an unreached people group. We will pray for those served overseas because of the funds generated from our basket. We will debrief with the kids after the auction and celebrate with them the good results. Do you see all that God is going to be able to do simply because we said we’d fill two themed baskets? Our family will talk, pray, strategize, go somewhere, and fill a basket together. Our family will draw more tightly together. And unreached peoples overseas will benefit as the funds generated provide them an opportunity to experience Christ. Did we wait for the “handwriting on the wall” (or in our oatmeal) leaving no doubt that we should fill a basket? Would God forcibly have turned us down a toy aisle and robotically made our hands reach out and pick up toys for a wagon, demanding our participation? Obviously not. Will we find our flesh craving to go home after the endless number of soccer games to just kick back and rest rather than talking, praying, and filling a basket? Possibly. But a family who lives with intention realizes they have but one life on earth. And because they want to live a life that impacts eternity, they actively arrange life that moves beyond self. You see, I think God really loves to see people disrupt their lives on purpose. In a culture of entitlement and entertainment, we as parents must purposefully determine in our hearts that we want our children to be different and then give them opportunities to practice surrendered lives to Christ. It is so easy to think that “when my children are older, we will do…” But friends, their worldview develops most when they are so young. Our intentional parenting in their younger years will impact them in their later years. I would love to learn from you how you are disrupting your family’s life to parent your children with purpose. I would love to hear how you intentionally disciple your children to live out their faith now.